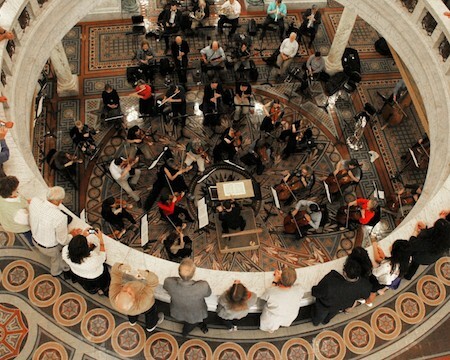 The Fort Wayne Philharmonic returns to the splendid domed rotunda at the Allen County Courthouse for a free concert in its Live At Lunch series of performances in public spaces. Caleb Young conducts the Philharmonic in a lunchtime program of crowd-pleasing favorites from the orchestral repertoire. Bring your lunch and listen at floor level or from higher vantage points. PLEASE NOTE: Cell phones and other electronic devices are not permitted in the Allen County Courthouse.